I've been going through some old recipes lately of things that I used to make for the kids that they loved to eat before our food world was rocked 2 1/2 years ago. I love things that are easy to throw together and that get eaten in one sitting. When we have leftovers, it is not usually enough to feed everyone, and we often end up throwing them away. So when I find a dish that everyone likes, I stick with it. 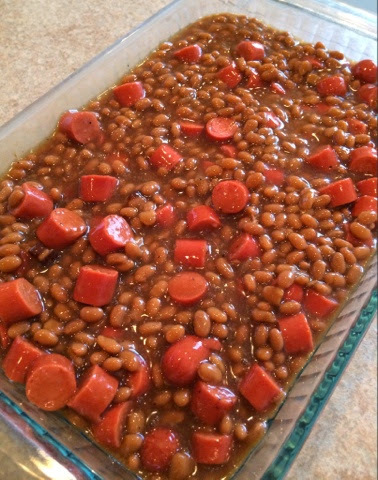 Who doesn't like hot dogs and beans? Throw on some corn bread, call it a casserole, and you have a winner. Now, I'm not advocating that this is the most healthy meal, and they are probably ways to make it more healthy (organic hotdogs, etc), but I just made do with simple ingredients. Preheat ovento 350º. Spray 9x13 glass dish with cooking spray. Mix together cut hot dogs, beans, BBQ sauce, and brown sugar. 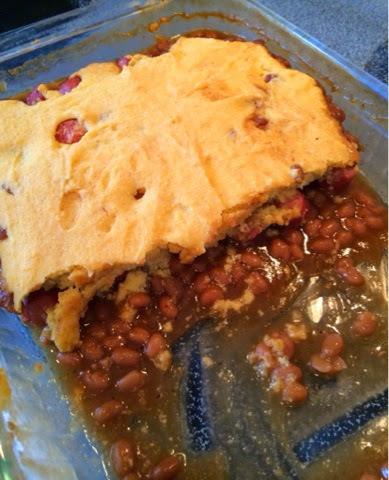 Spoon into baking dish. Cover with prepared corn bread mixture. Bake 45 minutes. Allow to cool. I recently found this gem at WalMart. 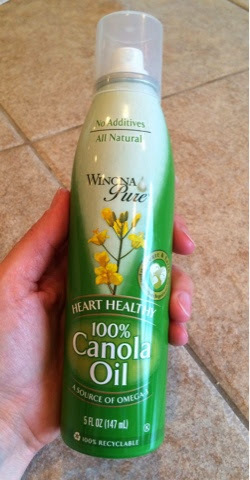 A cooking spray that doesn't contain soy! I realized after I started making this that I didn't have any BBQ sauce. So I improvised by squirting in a bit of ketchup and mustard, and sprinkling in a few dashes of garlic powder, onion powder, paprika, cinnamon, and black pepper. I also added a bit more brown sugar than is called for. Once it was all mixed up, it had a pretty good flavor. You could also add some molasses and Worcestershire sauce, but I didn't have any. I've also seen some recipes that call for honey. Just flavor to your taste. The Hodgson Mill corn bread mix calls for milk and eggs. I used rice milk and egg replacer instead. 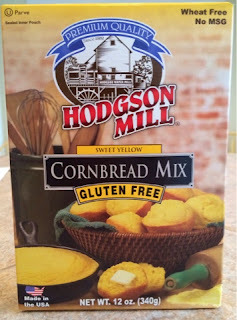 You could easily add some applesauce, apple butter, or other yummy things to add flavor to the corn bread. As expected, the kids LOVED this meal. The big kids remembered it from the past, and the little girls ate it without complaint. It is quick to prepare, but it takes a while to bake. Tonight we went on a family bike ride while it was baking. And dinner was ready when we got back home! Perfect evening!